Check out two videos from a recent concert: Busted and I Got a Woman - From the Ray Charles Tribute concert in Altamonte Springs. 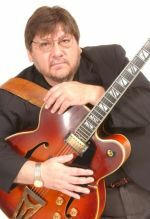 Guitarist/vocalist Rich Walker has been playing Jazz and Blues for thirty years, both on the road and in the Orlando area. 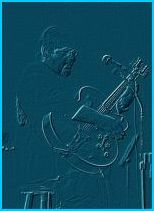 In recent years, he has emerged as a leader, as an extraordinary soloist, and a very exciting Jazz/Blues vocalist. It is obvious when one listens to Rich play that his roots are in the blues, citing his major vocal influences as Ray Charles, Joe Williams, Jon Hendricks, Betty Carter and Al Jarreau. Anyone with a love for, or a background in jazz will hear the influence of Wes Montgomery, Pat Martino and George Benson in Rich's guitar playing. Rich is a familiar face in many of Central Florida's jazz clubs such as Valentyne's, Dexter's and the Joshua Tree. He has also played the Kool Jazz Festival, The Clearwater Jazz Festival, The Orlando Jazz Fest and the Cocoa Beach Jazz Festival. Rich has recorded recently with Ira Sullivan, Dr. Lonnie Smith, Marion McPartland and Nick Brignola. Although Rich is a guitarist, he feels his most profound musical influence was that of the late saxophonist John Coltrane and "the music he left behind for us to learn".